You are here: Home / Yoga Articles / Awakening • Creating a More Beautiful World / The Process of Kundalini / Has Modern Yoga Been Dominated By The Masculine? It’s interesting what happens when you ask a difficult question. You’ll note that there is only one man featured in this edition of The Community Speaks, our roundup of perspectives from influential people in the NZ and Australia yoga communities. This is not for lack of trying on our part—at least 11 men were invited to be part of this, but the majority of them didn’t reply to emails. Perhaps it’s an indication of how uncomfortable and challenging this question can be, or perhaps there were other dynamics at play. It’s not a perfect question, I know that. I received feedback that the quote I provided was unclear, provocative and taken out of context. Point taken. But it’s a real question, one that deserves to be asked and considered, even if it frightens us or makes us cringe. Has contemporary yoga been dominated by the Masculine? In response, I was delighted to receive the following answers from three brave women, and one particularly brave man (thank you, Neal!) Their stories and insights are grounded, embodied and overflowing with wisdom and compassion. Worthy answers to this difficult and imperfect question. As a teacher and practitioner of Yoga for over 20 years, this comment by Mark Whitwell heartens me. My early years of studentship were in a very masculine school of Yoga. We were taught that the body was viewed as something that needed to be fixed, perfected and aligned in a certain way; sometimes rather brutally. This led me to a striving for perfection and deepened my sense of not being worthy. In my life, this showed up as me constantly trying to fix and change things. I was feeding into the collective consciousness that is rife in our world, that we are not enough. I had to find another way a more feminine approach one that nourished and fed my soul. I was blessed to find teachers who viewed the body as alive, awake, intelligent consciousness its self. That every body was exquisitely unique and that it loved to breathe and unfold in spirals and circles, as well as linear back and forth. This way of practicing, led me to a deeper acceptance of myself and others exactly as we are. Collectively growing a new way of being; I am already more than enough. The world does not need more people thinking they are not enough, not worthy enough, not ‘awake’ enough. The world needs more people who know how to love and accept themselves exactly as they are. Isn’t that what we want to grow together in our Yoga communities? Sarsha Hope is a Lululemon ambassador; Head of Health and Wellbeing at Sherwood and runs 200 hour Teacher Trainings in Queenstown in collaboration with Nadi Wellbeing Centre. A highly recommended book by Philip Shepherd, New Self , New World, discusses how and why so much of our western culture is driven by patriarchal influence, and how this reaches back thousands of years (see this article, Out Of Our Heads). Perhaps Mark’s comments on modern Yoga reflects this wider imbalance. Yes, we live in a world which encourages striving, achievement and doing. Where more is better, we need to be better, more correct, with hierarchical levels of success. It is easy to see how this approach to life may have permeated into some Yoga teachings, styles and practices. Instead, can we begin to recognise that while there is the effort needed to arrive in the practice, Yoga is equally about letting go of effort, of striving and achievement? Being effortless in any practice points towards our own innate mastery and wholeness. Let us re-orientate our Yoga to a more balanced approach of “being Yoga”, just as much as “doing Yoga”. While we may enjoy the challenge a physical Yoga practice brings, can we also honestly observe our habitual tendencies and meet another kind of challenge? To balance any propensity to striving and achievement, and to meet and welcome ourselves just as we are? Can our Yoga practice be inclusive of an enquiry approach to learning, to ease, grace, kindness and equanimity? Yoga is an inner journey. Let us deeply listen to our body’s natural intelligence and inhibit any tendency to override our body. To honour, trust and respond to our body’s messages – so that our life choices are wiser, more balanced and reflect the deeper truth of Yoga, that right here, right now, we are whole and divine. Neal teaches regularly on Waiheke Island, on the teacher training programs with Auckland-based Contemporary Yoga, as well as offering workshops and retreats through New Zealand and Australia. Contemporary yoga has a myriad of approaches and many are driven by the left-brained, forceful, dynamic qualities. I believe this is partially due to the Western world being strongly body-oriented and ambitious, thus gravitation towards this approach and perhaps those types of teachers. Our own attitudes and habits are often imposed on the way yoga is taught or received. Yoga has been imported in recent times, yet often changed greatly from the roots by the time it reaches the gym or yoga studio. Also, one aspect, usually asana, has been taken out of the context of the whole and the original approach has been lost in translation. Yoga practices in the West have also been mostly extracted from a huge yogic repertoire, which is blended in a spiritual, cultural soup. This blurring of lines also creates challenges, with some Hindu overlays, being male-dominated and potentially carried into modern yoga. However, this in no way represents the myriad of approaches, traditions and teachers available to us in modern times from India. My own tradition offers a balanced, gentle approach for differing needs with a strong link to the Shakta, feminine traditions and heart-based practices. 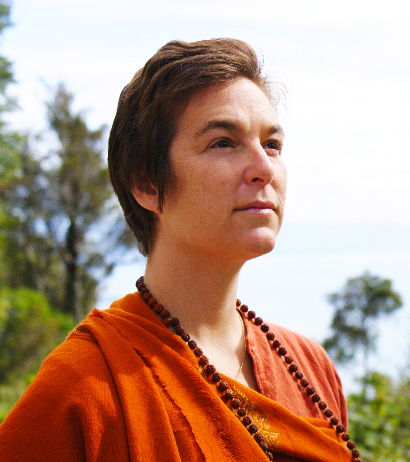 Swami Karma Karuna, teacher, writer and spiritual director of Anahata Yoga Retreat, Golden Bay, New Zealand runs Yoga Nidra Trainings and yoga events around the world, including guiding groups to India. Ironically yoga practices were designed only for men and yet in contemporary yoga, it is women who predominantly frequent the mat. Ostensibly the curves of the female shape have been trying to fit into the postural garments of the masculine form. It no longer makes sense. Whether inhabiting a male or female body our human bodies are intelligently designed to grow, renew, transform and evolve consciously on all levels. There is a new awareness emerging and revolutionising militant masculine patterning or what Mark Whitwell terms ‘male righteousness’. This new awareness is not a defensive strategy to retaliate against or counter-pose what has previously been taught but rather is a growing emergence of recognition that we are already what it is that we seek. We can trust our innate knowing. We can empower ourselves by honouring and respecting this vehicle of our body on life’s sacred journey. We can expand from the inherent union within ourselves of the divine masculine ~Shiva, AND the divine feminine ~Shakti. We humans are organic, instinctive and intuitive beings who spiral through life on all levels. We are part of the pulsation and undulation of life as it lives itself. The angular forms, linear movements and mechanical instruction that stems from male created systems have paid little attention to the fluid, rolling and circular motions of the feminine. Rigid patterns of being and straight line thinking have created an inner tension and unrealistic expectations of ourselves that encourages a push, drive and strive mentality. This dries us up, taking the ‘juice’ out of life. It is clearly not sustainable for ourselves or this planet. The more we awaken to seeing vulnerability as strength, feeling authentic, compassionate connection with others as real power and brave an intimate and embodied relationship with all aspects of our selves the more we awaken to the joy, love, grace and true essence of who we really are. Sandi Murphy runs Nadi Wellness Centre/Yoga Nadi & Co-Directs Soul Journeys Wellness Retreats. Nadi offers an annual 200 Hour Vinyasa Flow Yoga Teacher Training in Queenstown, NZ.